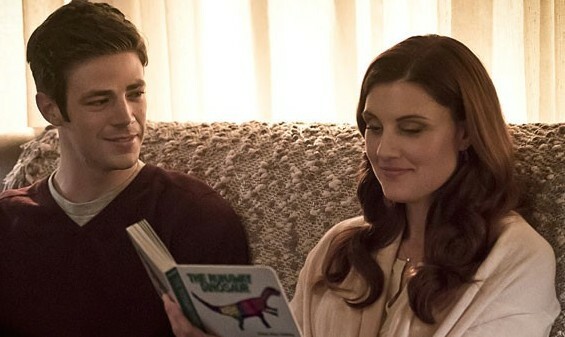 Home » The Flash, “Runaway Dinosaur”, Review! The Flash, “Runaway Dinosaur”, Review! Season 2 wraps up with a Kevin Smith directed episode before the last two shows. Flash restored his Speed Force through another particle accelerator charge, both Wally and Jesse were hit, but Barry was vaporized! The burnt remains of his suit is seen by his friends at STAR Labs. Wells tries to contact Jesse and they rush to find them struck down. Wally recovers, but Jesse’s heart has stopped, then she revives. Iris tells Wally that Barry’s gone. Joe tries to get Henry’s help for Jesse. Cisco touches the suit and sees a vision of Barry in a storm. He opens his eyes in his bed. His room as a kid with pictures of dinosaurs and the children’s book, The Runaway Dinosaur. Barry walks down the stairs to see Joe at the crime scene. It’s not Joe, the Speed Force? “Joe” explains that “we” were there when the first subatomic particle was formed, the Speed Force. A shadow passes overhead. He has to catch the shadowy speedster running through the street. Cisco tells everyone and Wells realizes he’s in the Speed Force. Henry checks on Jesse. Cisco goes with Iris to find the records in the “Morgue.” The door slams down and it’s Girder (Greg Finley) who was killed by Blackout in season one. Cisco remarks (terrified to go down to the Morgue, but not when running into the Walking Dead? ), “A zombie? For real?” Girder crashes through the tables with Iris standing in front of Cisco, love it! Girder breaks out into the night streets. Barry stops at a park out of breath. It’s Speed Force Iris. Barry is worried about Zoom. Cisco runs to tell Joe that the particle accelerator activated zombie Girder. Jason Mewes’ character walks out of Big Belly Burger to see Girder tear up his mother’s car. Wells has a plan using Cisco’s Vibe power to direct Barry out of the Speed Force. Cisco appears in the storm and Barry hears Cisco’s faint voice. A tornado appears in the lake of the Speed Force. If he goes, it will be without power. Cisco reaches out and the shadow flashes past. Iris wants it to stop and Wells disconnects to release Cisco. Iris sees that CC Jitters was smashed by Girder. Henry thinks from his prison days that some memories are remaining in the zombie and Iris offers herself as bait. Barry stops again and meets with his Speed Force father. He has taken Barry to the gravestone of his wife. Joe is back at the house to check on Wally. A crash, the approach of Girder, Iris rushes out. She whistles for Tony, Girder, and runs towards STAR Labs. Speed Force Henry confronts Barry with the question of choosing his life over his mother’s life. Iris runs into the lab with Cisco setting up electromagnets to shut down Girder. Cisco blasts Girder, but there is no effect! Barry is running to his house. He sees the Speed Force version of his mother (Michelle Harrison). It’s a tearful reunion. She reads him The Runaway Dinosaur, “you have the mother who is just right for you and will always love you.” Um, where is that book? Barry grabs hold of the shadow Barry (very Wizard of Earthsea) and turns into the Flash. Iris offers to Vibe with Cisco and they enter the Speed Force storm. Iris holds out her hand to Barry and his mother tells him, “Run, Barry, run.” Iris pulls him out of the Speed Force and hugs him. Cisco brings Barry up to speed. Girder smashes through the door. The Flash leads Girder away with Iris and then fights with him. He runs so fast it charges up the electromagnets and Girder falls. Wells is with Jesse when Barry walks in and touches her sending the Speed Force. Henry examines his son and promises to stay with him. Iris and Barry go to Nora’s gravestone. Earth-2, Zoom confronts Caitlin he wants her to choose him or death. Zoom addresses a room full of his supervillains. Four Flash rings out of Five!